I lived in the country, and it lived near, and the thing that was able to be made came to self sufficiency in a necessary thing from childhood making anything ..use... Still, being possible my to do is myself. Anything causes the confidence of cost that the saving and anything can be done when is even if unskilled in DIY. This confidence becomes a challenge to the following. When time is politely taken, the make can make a good thing though it doesn't match the specialist. And, it is possible to do while thinking about the way set to the site. This floats a good idea since the case requested from the trader. I want to inform you of information that devises in daily life such as Stamping out well digging and Drain and septic tank, and helps you of the additionally usual feeling etc. The page that I made is a matter that I chiefly experienced though there are a lot of pages that imitate others' pages in the people. I think that you are practicably benefited. When it can inform them of it, I think that I am glad when there are an opinion and an impression. The piercing well doesn't dig up the large range, and it is possible to dig up the amount of the dug soil with an easy tool few, and compared it. This photograph is a stamping out well of about 9m up which I dug by the hand digging and the pump. Sand is put up to the sucking up pipe. 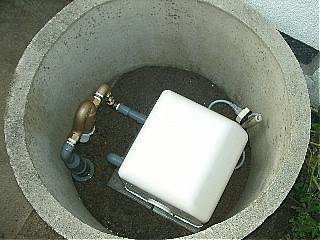 The well and the pump were put in a concrete well frame (Idutsu) of 75cm in the inside diameter for a reduction, a freeze proofing, a direct sunshine avoiding, a rain avoiding, and mechanical protection of the noise. Idutsu's lid painted the coal tar on the waterproof and preservative making it from the board of the tree of about 2cm thickness. The well pump is PAL-2531BR of the three-phase circuit electric machine. It is a fixed pressure automatic pump for the shallow well of the accumulator type of the electric motor output 250W. The pipe on the side of pushing out was laid with VP20. The hole was made from the earth for the concrete of the base and it was assumed the below the floor level piping. Why should I paint on the cement tile and the slate roof?It is because a small hole is innumerably open on the surface of the cement tile and the slate roof by [zarazara]. It causes the moss and mold for water to do to the hole, to see, and to grow. Moreover, the hole is expanded in addition because it makes to winter, the seen water freezes, and it expands. Then, strength of the roof rapidly falls into deterioration rapidly willingly. Only the person gets on up and the cement tile and the slate roof that has not been painted for years how many might crack. It is necessary to paint in paint, to reed the surface of the roof to prevent it from becoming it like this, to do by water, and not to see.